This year H&DAS is putting on a fish growing contest for our members! Sign up at our September or October meeting to pick up your fry at the November meeting. Charles Drew will be providing the club with gorgeous, high quality Koi Swordtail fry. Participants will receive 5 fry for $5 to grow out in their home aquaria. We will hold a jar show for these fish at the June meeting with two classes (male and female). Prizes will be awarded to the top 3 fish in each category. Entries are limited to one male and one female per participant. Prizes are gift certificates to local fish stores: $50 for 1st place, $25 for 2nd place, and $15 for 3rd place. Every participant who brings fish back for showing will be reimbursed their $5 purchase price. I hope you had a great summer. It seems summer is the season that goes so quickly. My ponds did really well and my Koi are growing really large. Luckily the raccoons and skunks in my neighbourhood didn’t get them. It’s a new season for all us fish lovers too. We have a few new ideas for the 2017/18 year. We will be having a Fish Growing Contest for our members. Sign up at the September 14th or October 12th meeting for pick up on November 9th. 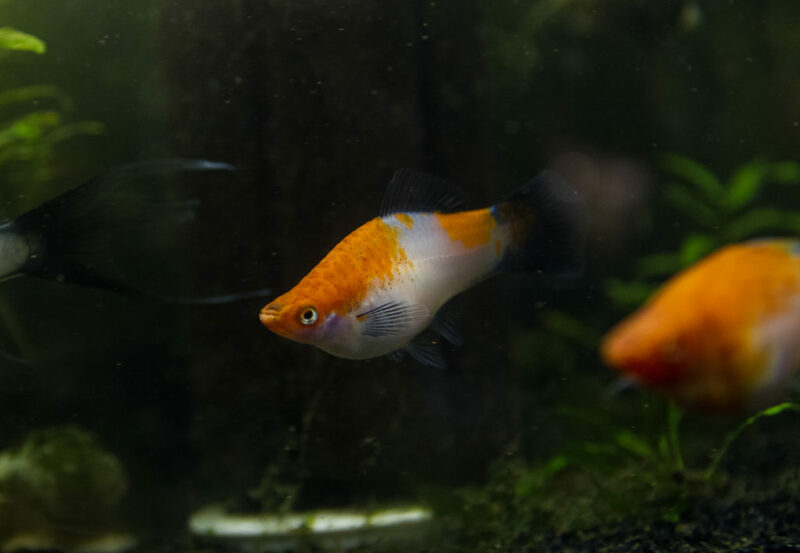 We will be providing beautiful Koi Swordtails generously provided by Charles Drew. Come out to our meeting for details. Our fall auction is on Saturday September 30th at the Waterdown Legion, 79 Hamilton St in Waterdown. Doors open at 8am, the auction will begin at 10am. If you are interested in renting a table to sell used goods please contact me (president@hdas.ca). A limited number of tables will be available. The sellers sheets and auction rules are available on our website. Our guest speaker this month is Karl Schwarze. He will be completing his presentation “My Seven Ponds”. Karl is an amazing speaker with loads of pond experience. Please bring your questions. Well, that was so much fun! I can’t believe the CAOAC Aquatic Expo 2017 is over. Whatever will the H&DAS team do with all their free time. There are not enough words to thank this team for all their hard work. You made this look so easy. I hope those of you that came out to the Burlington Holiday Inn had as great a time as I did. I really enjoyed this experience. Our speakers Ian Fuller, Eric Bodrock, Regina Spotti, Lawrence Kent, and Gerald Griffin were amazing. The Convention hosted the First Canadian Biotope Competition, thank you Frank Aquirre for making that happen. To Betta Breeders Canada, Trans Canada Guppy Group, Shrimpers and Southern Ontario Killifish Society – thank you all for your participation. We had incredible fish shows and auctions throughout the weekend. Thank you to all our sponsors and to those that donated products to help support us. Thank you to our vendors throughout the weekend. What should we do next??? Our June speaker is Ken Boorman and his presentation will be on Australian Aquarium Fish (other than Rainbowfish and Blue-Eyes). Our Jar show classes are Killifish and AOV. Karl S had an really great pond program last month. He will be presenting the 2nd half of his presentation in September. Please let us know if you have a program you’d like to see. We are always looking for suggestions. A big “Thank You” to Jessica B for her awesome presentation ‘Made in Hamilton: A Fishroom Tour’. Amazing! Our May program is on “Ponds” and will be presented by our own Karl Schwarze. I’ve seen Karl’s ponds and I look forward to this presentation. I just can’t believe it’s May already. A year ago our club decided we’d like to host the 2017 CAOAC Convention. Since then it’s been so exciting working with our team to make the ‘CAOAC Aquatic Expo’ a reality. We have a great speaker line-up: Ian Fuller, Eric Bodrock, Regina Spotti, Lawrence Kent, and Gerald Griffin. Each speaker is individually wonderful but to have the opportunity to share this group with all our ‘fish friends’ is amazing. We have the 1st International Betta Show and Auction, Trans Canada Guppy Group Show, Shrimp and Killi specialty classes, Biotope Competition, and hopefully you attending. There will be several vendors to help accommodate our wants and needs. So many sponsors and donations (please visit our site) and therefore lots of prizes and raffles. You don’t want to miss out. The Vendors, Auctions, and Show Rooms are open to the public at no charge. Betta Show at 4pm Sat and CAOAC Aquatic Expo Auction at 11am on Sunday May 21. If you haven’t purchased your full convention or speakers ticket yet you can still do so. Please check our site for more details. Hope to see you at our meeting or the 2017 CAOAC Aquatic Expo. Wow! Spring is here and what better way to start off the season than with our Spring Auction on March 25th! I’d like to thank all the buyers and sellers and most importantly all the volunteers; we can’t do this without you! I hope you enjoy all the other auctions this season, including the auction at our CAOAC Aquatic Expo 2017 on Sunday May 21st at the Burlington Holiday Inn. Our club is very excited to be hosting the CAOAC Aquatic Expo Friday May 19th to Sunday the 21st. We are celebrating our club’s 67th anniversary and I’m looking to share stories, memorabilia, and past events; so if you have anything to contribute please contact me at president@hdas.ca. Full convention tickets are available for the Early Bird price of $85 until Tuesday, April 18, after which they increase to $90. All those who purchase Early Bird tickets will be entered in a draw to win a watercolour painting created especially for our event by Ken McKeighen. The vendors room, fish shows, and auctions are open to the public throughout the weekend although the shows will be closed for judging. Please visit our site for more details hdas.ca/convention, details will be updated regularly. Zack Brideau from KWAS and Reef Ontario was our speaker in March. It was an awesome presentation! For our April meeting, our very own Jessica Bullock will be presenting ‘Made in Hamilton: A Fishroom Tour’ Thursday the 13th at 7:30pm. I can’t wait to see you all there. Our Spring Auction, Saturday March 25th, is just a few days away! Items to be auctioned may be fish, plants or any new fish related items. No open containers of fish food or medication will be allowed. No expired products allowed. You may rent a vendors table for any used equipment. Please limit the amount of each species or product to ensure top dollar. Used aquariums under 30 gallons are allowed, only if there are no cracks or leaks, and they are clean. You may pre-register as a seller until Thursday evening. Lot numbers will not be given out on Friday. Please contact Albert @ treasurer@hdas.ca to pre-register. I can’t believe it’s February already. I’d like to thank Zenin for his great program on filtration at our January meeting. Our program on February 9 will be presented by Frank Aguirre. Frank is no stranger to large tanks and he’ll be showcasing some of his super large installations. He will also be presenting information on biotope aquarium design and how we can participate at the 2017 Aquatic Expo. Have you signed up for the Home Show? We will need everyone participating to register by the end of our February meeting as this presentation is for April. Everyone is able to enter, near or far, our team is willing to travel, and everyone wins a prize! Our Spring Auction is Saturday March 25 at the Waterdown Legion. Come on out and enjoy the first weekend of spring. Come help us out as we can always use the help. The 2017 Aquatic Expo is coming along well. Have you bought your ticket yet? Last year I bought tickets for Valentines Day as a gift. Our first raffled ticket was won by Peter DeSouza. Hope you enjoy the meeting!